Home / Uncategorized / Testing myself against the Pros! Testing myself against the Pros! Let me put one thing straight: I am an amateur photographer! In other words it’s a hobby. I have a ‘real’ job as an IT Architect that pays my mortgage and extravagant climbing holidays. While climbing and travelling I shoot photos and write articles. Some gets published here and others get published in specialist climbing magazines. But how do I rank against the pro sports photographers? Probably not very well, but I decided to put my skills behind the shutter to a test. On Sunday I went to Lyngby Stadion to watch the Super-League game between Lyngby Boldklub and Sønderjyske. 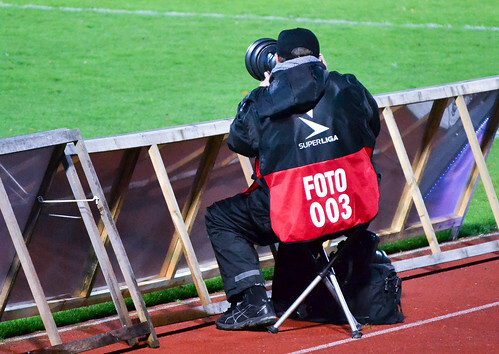 I bought a ticket and did not come with any photo accreditation, The security wanted to see my camera bag, but otherwise had no objection in me taking a Nikon D3100 equipped with a cheapo Nikkor 55-200mm lens to the spectator stands. This was my first time ever shooting pictures inside a football stadium. The game got on and I shot some pictures, but after 10 minutes the crucial moment came. Lyngby was on the attack and got a shot at the Sønderjyske goal. It was illegally blocked with hands on the goal line by Sønderjyske #3 Michael Stryger. He was shown the red card by the referee and Lyngby was awarded a penalty kick. Lyngbys Kim Aabech scored on the kick and Lyngby went on to win the game by 1-0. The line-ref has seen it and puts is flag in the air. I am going to let the pictures speak for them self and not pass any judgements on photo quality, but I am quite satisfied with my own performance.